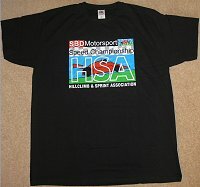 HILL CLIMB AND SPRINT - HSA MERCHANDISE FOR SALE! The HSA currently have a limited range of merchandise for sale. New items will be added from time to time as demand arises. Please note that all prices include post and packing and will be distributed by the HSA's Membership Secretary, David Smith.